Published in the South Kent Gazette, 11 March, 1981. The project to build St Bartholomew’s Church, on the corner of Templar Street and London Road, to serve the Tower Hamlets district, after lying In abeyance for many years, was earnestly pushed forward In 1877, and on the 27th of September in that year, the foundation stone was laid by the Rev Canon Carter. The designs were drawn by the Diocesan Surveyor Mr Joseph Clark, F.S.A., and the building work was carried out by Mr W. J. Adcock, of Dover. The style of the church was Early English. It was 111 feet long, 55 feet wide, consisting of a clerestoried nave of five bays, side aisles, apse-shaped chancel, an organ chamber, and a north-east chapel, the latter being built subsequently as a memorial. A heating chamber and vestry were later added on the south of the chancel. The ecclesiastical district of St Bartholomew was formed on the 18th of December, 1877, and the Vicarage, which was endowed with £200 a year and a residence, was vested In Keble College, Oxford. The contractor’s price for the building was £6,370, but its total cost was £7,500, and as it accommodated 750 persons, the capital outlay was exactly £10 per seat. The church was consecrated by the Archbishop of Canterbury on the 22nd of January, 1879. “For more than seven years a corner piece of land adjoining the London-road, Charlton, remained unoccupied, surrounded by a fence, above which was the notice “Site for the new church. Subscriptions received at the Banks.“ For a long time the banks were not troubled with many subscriptions, and the hoarding around the site did good service as a bill-posting station for a local auctioneer. A fair rent for the posting station would, in time, have provided a nest egg to start the building fund, but the zeal of the churchmen of Dover could not wait for that. In the early part of 1877 a meeting was called in the Council Chamber, under the auspices of the Bishop of Dover, and sufficient funds were there subscribed or promised, together with the sum already in hand, to warrant the commencement of the building. Mr. Clarke, the architect, drew the plans, and the contract was taken by our noted local church builder and restorer, Mr W. J. Adcock, who in the space of eighteen months, notwithstanding many obstacles, has completed the edifice In a very workmanlike manner. “The east end of the church abuts on the London-road, and is a conspicuous object being surmounted by a large black cross. At present there Is no tower. The materials used are Kentish rag and Lincolnshire stone externally, and Bath stone inside. The structure consists of nave, side aisles, transepts and chancel. The nave Is supported on either side by five arches which open into the side aisles, and In each arch Is a circular gaselier. Over each of the nave pillars Is left a jutting block of unhewn stone, intended In future to be sculptured into heads, a kind of ornamentation, which the funds would not now permit. Above is a lofty clerestory, the windows of which are capable of being fill opened simultaneously by a mechanical contrivance, thus securing good ventilation. The roof is open work in polished pitch pine, elegantly finished. And the roof internally of the other parts of the building is similarly constructed. “The style of the architecture is plain Gothic, of an early English type. The side aisles being rather low, the windows are comparatively small. There are two doors, one on the south and one at the west, and over the latter Is a good-sized window. The north trancept, too, is well lighted, but the southern one is blocked up by the organ and vestry. On the chancel the largest amount of expenditure has been bestowed. It is separated from the church by a low stone wall with an opening and three steps in the centre, forming an entrance. Within it are the oak choir-stalls, artistically carved, affording plenty of room for a large choir. Further on two more steps lead up to the altar rail, and within that on either side are tall brazen candlesticks, very large and massive, about seven feet high, on the top of which are large imitation candles about five feet high. The tall white shafts looking like large candles are, however, hollow tubes. In which ordinary wax candles are placed on a spring which lifts them as they burn. The opening of the new church, like that of Charlton Church nearby, was marred by some controversy. Exception was taken by some sections of the Anglican community to the illustration in one of the windows of the Virgin Mary, and before the consecration service the Bishop of Dover made representations to the Archbishop of Canterbury who wrote to the Vicar advising him to remove the picture, showing Mary nursing the infant Jesus and with men in the attitude of adoration before her. The first vicar was the Rev E. L. Churton (afterwards Bishop of Nassau); he was followed by the Rev A. L. Jukes; who, in turn, was succeeded by the Rev E. G. L. Mowbray, who in 1906 was succeeded by the Rev Alfred Lloyd Coates, who came from the Vicarage of Shorne, Gravesend. Another substantial building in London Road Is the Primitive Methodist Church, built In 1901. This stands just on the border line of Buckland, in part of the Bartholomew Fields. When the Primitive Methodists first missioned Dover, in 1848, they made some of their first converts in Charlton, their first mission room being a cow loft In Brook Street, not far removed from this new building, which was erected as a substitute for their first chapel in Peter Street, which they sold, and which was then converted into a store. 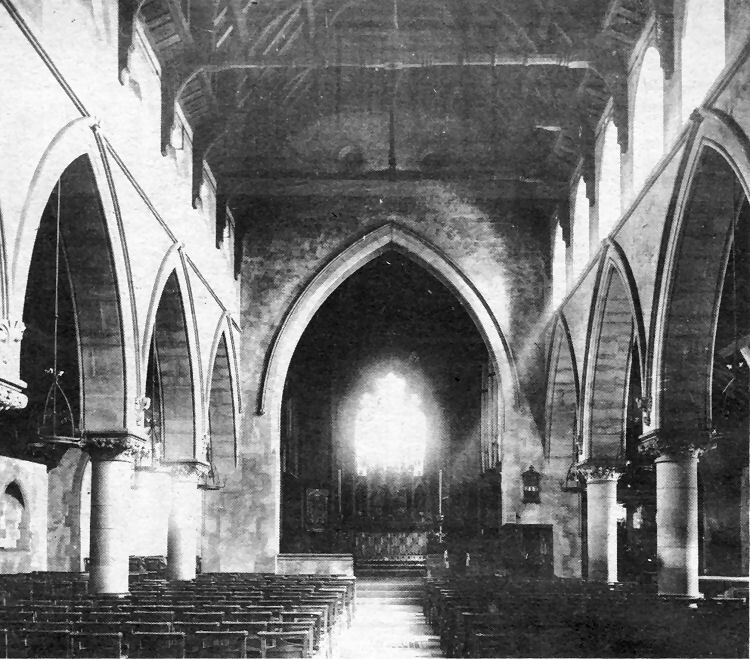 The interior of St Bartholomew’s Church photographed over 80 years ago before an elaborate wooden screen was erected across the entrance to the chancel Behind the altar is a beautifully executed reredos, divided into three sections with, in the centre, a sculptured life size figure of 'Christ on the cross, two disciples, one on each side and a woman kissing his feet. In the openings on either side are figures of Apostles. Above the reredos the stained glass windows represented the adoration of the wise men, Christ curing the blind, Christ’s ascension, Christ Messing little children, and the feast at Galilee. Two particularly interesting features of the church were the roof beams and the "eye“ window openings above the chancel arch.